I think I don’t want to talk too much about the news that SPH is trying to spin off its property assets into a new REIT. We all know that this is in the works. Free up more cash, charge management fees, then use cash flow from newspaper publishing to create more. I also talk enough about the readership and the sustainability of the dividends in the past and an explanation by Buffett on why localized newspaper content still make sense. Essentially, I am still rather pissed by a national news publication read by so many people for being very bias towards a certain political party. I will much rather leave my readers with some articles to brainstorm about the viability of SPH’s newspaper business. Felix Salmon at Reuters wrote a very good 2 part article on Content Economics. For those interested in how content monetization works, how to charge, the pros and cons will be interested in this article. It is especially interesting if you are a blogger producing content like myself. Central to the theme of the post was the concept of value versus price. Putting up a paywall might not mean that the user get the full value. We have seen that in financial newsletters who charges us a pricy subscription but may not substantiate to your overall returns. Putting up a paywall will also mean that users can never experience the value of the content. Amazing offline resources like the Oxford English Dictionary and the Encylopedia Britannica are facing existential threats not only because their paywalls are too high for people to feel that they’re worth subscribing to, but also because their audiences are not being replaced at nearly the rate at which they’re dying off. The real reason why Fortune put up a paywall, of course, has nothing to do with how valuable Andy Serwer thinks the magazine’s content is. Instead, the paywall is just another way for the Time Inc brass to try to make money and keep the magazine’s rate base high, the idea being that people will be less likely to cancel their magazine subscriptions if they know that they won’t be able to read that content online for free. Which brings up a fundamental rule of online subscriptions: there is zero correlation between value and price. There are lots of incredibly expensive stock-tipping newsletters which have a negative value: you’d be much better off if you didn’t subscribe to any of them at all. And of course there’s an almost infinite amount of wonderfully valuable content available online for free, starting with Wikipedia and moving on through the sites of organizations like Reuters, Bloomberg, the Guardian, and the BBC. At the end of the day, it would seem that all roads leads to a world where if you are unable to build a relationship with your readers and make yourself valuable to them, this could go sour pretty fast. The second article talks about how SPH transform their business model in this digital age. I have always been wondering why won’t they separate and show when digital format of their papers will become profitable. I overlooked the fact the importance of effective pricing and product transformation. This included the global Boston Consulting Group’s recent assessment that "in most countries, print media companies continue to have commanding brands and strong consumer relationships". The Poynter Institute, which teaches journalism, also noted in an article last month that several studies had predicted "an extended economic shelf life for print, even as audiences swing digital and the search for viable digital news products continues". A third report by the International News Media Association had also painted the future of the news industry as a "print plus digital, hybrid industry". This is exactly the direction that the SPH division’s newspapers have taken, said Mr Daniel. "For SPH, the bottom line is we have built a successful business model for our print and digital products, both online and mobile. We can and will grow from here," he added. Mr Daniel noted that The Straits Times is now "a multimedia product: print, online, mobile, video as well as social media, with our staff working together across platforms". He added: "Later this year, The New Paper will turn 25 and will relaunch as a bold, new multimedia product. It will pioneer yet another new business model: a print plus digital price for newsstand sales." Touching on charging for content, Mr Daniel said that SPH was among the first media companies in the world to introduce digital paywalls, a practice now increasingly common at newspaper websites in the United States. He revealed that by the end of the financial year last August, The Straits Times had reached almost 30,000 digital subscriptions, bringing its total average daily circulation for both print and digital editions to a high of 374,000. The number of digital subscriptions has more than doubled since then, he added. Last month, The Straits Times’ website straitstimes.com and AsiaOne also hit record page views of 85 million and 66 million respectively. The reason that SPH can enact a paywall is due to the people that most value having up to date news and good local journalism (I don’t agree about this) reads their paper publication. By bundling their digital alternative and not having an overly high cost, it lets the users choose which format they prefer. Should digital becomes the format of choice in the future, habit and those that have enjoyed the value, would continue to pay for it. But this model will only continue to work if they can provide higher value compare to a cheaper alternative i.e. free. As Buffett notes, to produce local content you need efforts. For the universal global news, Google will be your best friend. This is probably the reason, SPH takes a very aggressive stance to protect their intellectual property rights, thus suing Yahoo last year. Would the new media be able to create a blue ocean? I highly doubt that. Although new media is more efficient and larger volume, being a less monopolistic market and lower barrier to entry makes me think that growth will still be anemic and that it is prolonging the obvious. What do you guys think? Have your opinions changed regarding SPH? 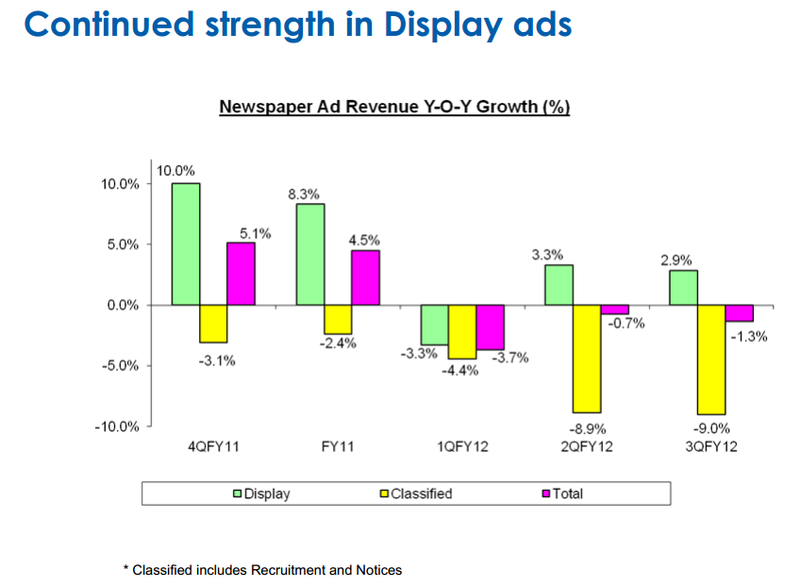 Singapore Press Holdings announced their Q3 2012 results yesterday. I went for a three week reservist training not too long ago and as I usually do not buy the Straits Times I took a look at it. The content is largely the same. The surprising thing was how thin the classified section was. Full page ads still look pretty well taken up. I asked around and seems like no one orders newspapers at home any more. But it is somewhat surprising that circulation figures published by SPH remains strong. Perhaps I didn’t pay enough attention to the figures as I suppose to. Classified section have shown a dramatic QOQ fall. It used to be that if you would like to sell cars, find jobs you have to use the papers because that is the most prevalent media. Now its different. Singapore is one of the country whose population spends the most time online. Online job sites, free classifieds like Hardwarezone to buy and sell things and SgCarMart provide better alternatives. SgCarMart charges $48 for a front page space to list your car for 6 days compare to $36 per day on a weekend classified listing. The puzzling thing for me is if everyone I talked to are not subscribing to it, why is the circulation still so high. Perhaps it’s the trend that people prefer to buy it off newsstand. Should the circulation trend continues to go down to a much lower terminal rate, advertisers will re-evaluate whether print media reaches their target audience effectively for the amount they pay for it. Other media sources could be more effective per unit cost. Revenue is likely to trend down base on economics. I still don’t see it being affected in a big way. SPH online media strategy is to capture all the popular eyeballs and be in the face of internet users. If there is a new startup garnering a lot of eyeballs, they will acquire it like Hardwarezone, if there is a lack of demand they will create it. They sell advertisement space on these new media. However, the dynamics of the economics of online information space is different from last time. In the old days, information sources are scarce. Its either the TV, newspaper or bill boards. Now, Singaporeans can have access to overseas content sites for niche information on healthcare, technology, investments. Singaporeans are a strange bunch. They have a tendency not to spend on digital goods compare to physical ones. They will need their news on their smartphones, but the usage pattern is also one that people need to consider. A group of people like to have papers so that they can occupy their journey to and from work. Now that Singapore have become so congested its not feasible to hold on to large newspapers. This would mean people not opting for paywall based local news. The advertisement revenue for digital space is also lower so all this means is that unless the Singapore folks value good local news, SPH will find it hard to totally replace print media. They can spread out the profit stream but its probably replacing a 50% ROA profit stream with one earning < 5%. Right now, these online media ventures are reflected in the Annual reports or financial statements as Others, which is losing money for a few years. SPH essentially look at them as some form of insurance hedge but doesn’t develop them as an income stream. I wonder if this is the right strategy to take. To compound to the two points mentioned before, the largest part of the cost for SPH have been staff cost, which accounts for 41% of total cost. With wage inflation rampant, this component have been rising due to increase in headcounts and better payout to retain quality staff. Revenue trend is falling, major cost is rising. Not a good picture. I was told by my friend that there were thoughts that SPH may want to sell of their Paragon Shopping Center. Looks like they make a wise decision not to. SPH in the past two years have sought to prepare for slowing news media income segment by building up a retail rental business. They acquired Clementi Mall at a crazy premium. Since SPH was originally not leverage, they can leverage up to increase their income stream. I originally like the idea that unlike a REIT, they would have the flexibility to pare down the loans using their excess income. But I realize that even with this new leverage segment, they are barely keeping up to pay their dividends. Paragon and Clementi Mall are likely to contribute $100 mil to their cash flow which can be used to pay their $0.24 dividend, which requires $383 mil. Even with Seletar Mall coming online in 2015, that should contribute another $30 mil at a 5.5% Cap Rate. SPH will continue to create more malls, but it only serves to make up for loss newspaper income stream. Warren Buffett was in the news a few months ago and also these few days telling the media he has been and will continue to buy newspapers. Essentially, what he see is that upside is capped and the price you pay for it is important. He sees that he can get reasonable value since these news corporation wants to sell away these papers on the cheap. Back to SPH. If you look at SPH as two publishing unit, the local and non local news, what they provide can be something that Buffett describes. In that context, There will always be a group that wants their news in physical paper form and are willing to pay for it. However, the internet penetration I feel, seem to point to a more internet, smart devices and TV centric news consumption and it points to Channel News Asia being a bigger competitor in the future. I see SPH as a bond like equity. When you assess this bond you look at the reward for the risk borne. As a media shop they are not going to go away, but a poorer business model means that this bond have no clear room for future growth. Free cash flow is maintaining at 380-400 by new property income stream. However the difference is that it is maintained by additional leverage. With a price earnings of 17 times and EV/EBITDA of 11 times, it seems to be value more like a fair stock but a great return on asset like IBM or ARA Asset Management. Yet the problem is that its future return on asset looks to be much weaker. Yield chasers would have to beware and not buy this at a dear price. I took some notes while looking through SPH’s Q1 report (notes here). Here are more notes. This chart starts from Jan 2002 to Early 2012. So its roughly 9 years. There was a sharp drop, which was due to a 5 for 1 stock split in 2004. 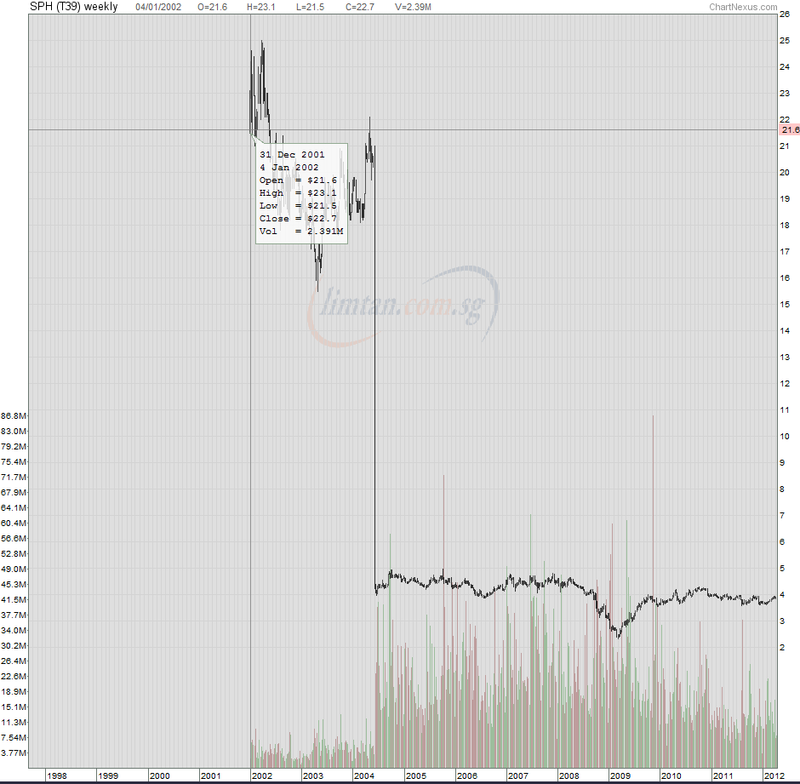 In early 2002, SPH started off at $22.70. That is approximately $4.54 in current price. Since 2008, we have not reached that price for 3 years. Total dividend collected is 72,48% for the 9 years. Total unrealized gains is –14.32%. Total returns 58,16%. Annualized dividend returns is 6.2%. Annualized total returns is 5.2%. Dividends accounted for 100% of the gains. The entry price, in this case is perhaps expensive. i draw comparison between this and China Merchant Pacific (analysis here), which is essentially a toll road schip. Since 2004 till now, for 7 years annualize returns is 7.7%. Would have thought SPH reinvestment could have yielded more. I have got some time on my hands and to be honest not many of my stocks are releasing earnings so I might review SPH. 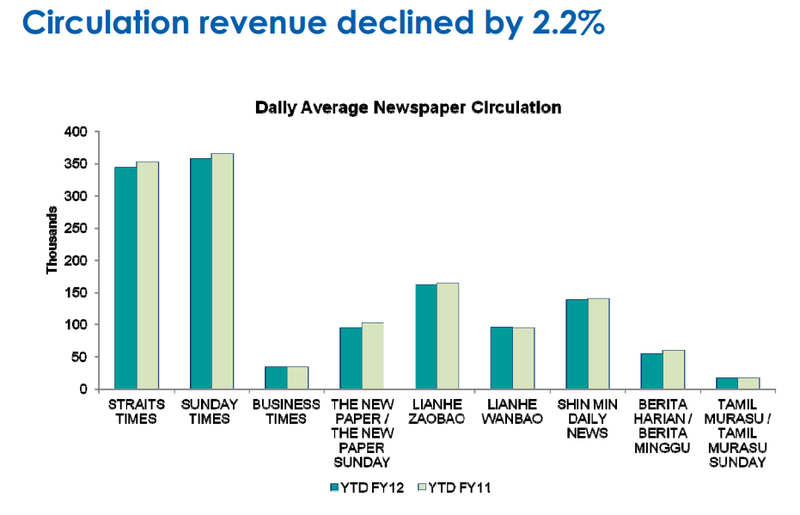 The earnings and revenues from the newspaper division was largely flat. The main boost to net profit came from their property rental. Clementi Mall contributed more than this time last year, hence the out performance. The online initiatives look to be barely boosting or making a dent to revenues. As such the tactic for SPH look to be maintain their newspaper and magazine business, get the cash and the market cap to build a property rental business. The question is whether you are comfortable with them bidding the highest price for all the sub urban land parcels and mall locations. To win, you have to bid, but the amount that they now bid as looks desperate or snobbish to say the least. The property rental covers 25% of the last dividends. We do know that SPH with UE bidded for the site in Seng Kang. SPH had a 70% stake in that joint venture. The size of the Seng Kang property is roughly going to be the same as Clementi Mall. That means in 1 year, we project it can add another $30 mil profit. That brings potential profit from property rental to $126 mil. Based on the newspaper profits (which is not going down) and property rental profit, SPH have no problems paying the 6.1% yield. Earnings yield is 7%. From the looks of it i don’t think they will be bumping up their dividends soon. In terms of PE and PTB, SPH shows the premium accorded to Blue Chips with predictable cash flow. If it is valued at 179% above book value, SPH must be earning some serious return on assets. SPH’s return on asset of 11% on 20% leverage looks above average, but still lower than 19% ROA for Starhub, which is yielding a similar 6.3% yield at $3.17 with price earnings at 15 times. Going forward, i don’t think SPH is cheap. Perhaps when it gets to PE 10 we can consider. To do that SPH will have to drop to $2.70, which will only happen in a recession.